LUSAS Civil & Structural LT provides quick and easy to use linear static analysis using 2D/3D structural beams and grillages. LT versions are of particular interest to companies wishing to standardise and expand on their use of LUSAS software throughout their organisation, and with Standard and Plus versions, provides a �one stop solution� for all your analysis requirements. Because all levels of the products use the same user interface and terminology, training costs can be minimised and users can be introduced to LUSAS at the most appropriate level for the work they need to do. There is also full data compatibility across the product range allowing easy migration of a model to a more advanced analysis when required without any data conversion or remodelling. The LT version uses the same associative Modeller for modelling and results processing as the Standard and Plus versions making upgrading to these higher versions very straightforward. The simplified LT user interface will help you to build your models faster. 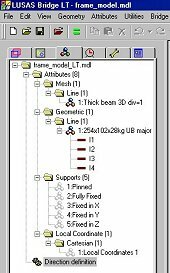 Startup templates are provided for grillage, 2D and 3D beam analysis, with line mesh and simple support data being pre-loaded into the Attributes Treeview. Models are created using point and line features, and wizards are provided for specific applications. Tapered beam sections can be defined. Additional model attributes such as supports, loadings, materials, etc. can be named explicitly, and once created are displayed in the Treeview for subsequent assigning to selected geometry of the model using the "drag and drop" technique. Built-in associativity ensures that if the model geometry is amended, all assigned loadings, supports and other attributes are automatically moved to suit. Fleshing (the visualisation of any assigned geometric properties) helps ensure that the orientations of beam members are correctly defined. A multi-level undo/redo facility allows quick modelling corrections to be made. Libraries of section properties are provided for UK, US, EU, Korean, Australian and Canadian steel sections. A standard section property calculator enables section properties for similar shapes to be calculated. 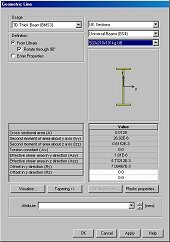 Basic engineering properties for bar and beams can also be manually entered. A library of common material properties is included and others can be user-defined. Models are formed of layers where the visibility and properties of each layer can be controlled and accessed via the layer name which is held in the Treeview. As the model is built up, model features may be grouped together and manipulated to speed up data preparation or to enable parts of the model to be temporarily hidden. The LT version supports a single graphical window for viewing the model and results. An OpenGL implementation allows for fast hardware or software generated graphical displays. Powerful cursor selection, full pan and zoom and dynamic rotation allow for easy viewing and manipulation of your model. For general use, concentrated, body force, global and local distributed, face, temperature, and internal beam loading is provided. Prescribed loading allows initial displacements to be defined. Discrete loads can be used to distribute point and patch over full or partial areas of the model, independent of the model geometry. For bridge analysis, comprehensive static vehicle, lane, and knife edge loading types are provided for many regional codes of practice. These currently include: AASHTO LFD & LRFD (USA), BD21/97 (UK), 21/01 (UK), BD37/88 (UK), 37/01 (UK), BRO94 and BRO2002 Vehicle and Classification loads and BRO Train loading (Sweden), Korean, Israel, Norway, and HK (Hong Kong), Australia, China, Eurocode vehicle and train loading, Finland, India, New Zealand and Poland. Additional static loading types are being added all the time. A moving vehicle load facility is provided to enable these static loads to be passed across a structure. Basic and Smart load combination facilities are a key feature of all LUSAS Civil & Structural products and allow manual or fully automated assembly of design load combinations. Envelopes, contour and deflected shape plots, and results graphs can be readily obtained for any loadcase or combination of loadcases under consideration. Basic load combinations allow for manual definition of loadcases and load factors. The Smart Combinations facility automatically generates maximum and minimum load combinations from the applied loadings to take account of adverse and relieving effects - saving time and reducing the chance of errors. This LT version supports a single results viewing window that can hold a number of predefined results layers. After selecting a loadcase, results are viewed using separate layers for contour, diagram, deformed mesh, vector and discrete value data. Diagrams of bending moments and shear forces can be displayed on deformed or undeformed fleshed or unfleshed members. Beam stresses can be plotted at specified fibre locations. An animation wizard can show how a structure deforms from an un-deformed shape to its loaded deformed shape. A graph wizard provides a way of investigating the change of bending moment at a node for a sequence of moving loadcases. Views of your LUSAS model may be printed directly to your default printer from page layout or working mode and a printing scale and origin can be defined. Model views can also be copied in high resolution for pasting into other applications. A report wizard allows model and results data to be selected on an element, feature type, group, and loadcase basis for output into various formats (including MS Word .DOC format) for model checking and quality assurance purposes. The contents of a model window can be saved or copied for use in creating reports in applications such as MS Word. All results can be output for use in spreadsheet applications such as MS Excel where additional graphing or calculations can be carried out. 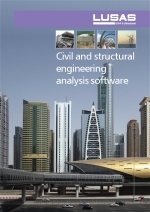 Model and results files created by LUSAS LT versions can be read by other LUSAS Bridge or LUSAS Civil & Structural software products. Model and results files created by Standard and Plus versions can be opened for editing and viewing in LUSAS LT provided the model contains only those elements supported by the LT version. Any modelling and analysis capabilities described on this page are dependent upon the LUSAS software product and version in use. Last modified: April 25, 2018.